I am a new customer. 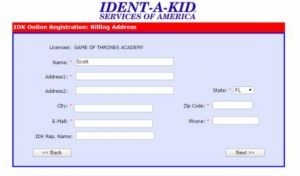 How do I create an online registration account? I have a registration account, but I do not have the login credentials. What should I do? How can I customize the main check in screen? Can I add my school logo to the main screen? When I open my Manager, it says that I’m running on trial but I paid for a license. How can this be remedied? Open the Client. You should see a screen similar to the one pictured below. 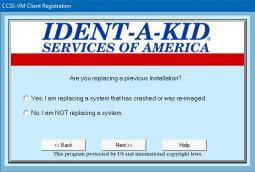 Select the version of Identakid VM that you purchased. Click Next. As pictured below, the program will make sure that you are running as an administrator. The next screen will ask you for a license code and school number, which you may not have yet. 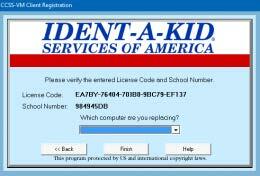 There is an option at the bottom that states you don’t have a license code and school number yet. If you do already have the licensing information, enter it here. If you are unsure, give us a call. Click Next when you’re finished. If you are replacing a system, click Yes. It will then give you a list, by Location Name, of any system that you currently have registered and that has not been online in more than 30 minutes. (After all, we don’t want you accidentally replacing a working system!) Select the Location Name of the system you want to replace, then click Next. If you arent replacing, just click No and click Next. This screen will ask you to enter a Location Name. This name doesn’t have to be something specific but we recommend you name it something that is easily remembered as you will need to recall this info if you ever need to replace an installation. If you do not have a local director, keep reading! You will need access to your schools online registration account. If you don’t know what this is or do not have access, give us a call at 1-800-890-1000 Option 2 and we can assist you. 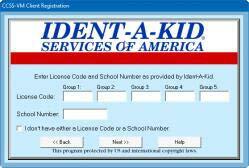 Log into your registration account through www.identakid.net/ereg. You should see a page similar to the one pictured. 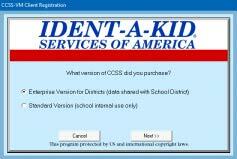 You should have a Registration ID listed as CCSS-VM v 3.0 School Acct. Click the radio button next to that Registration ID. For Subscription Period, select either one, two or three year license, depending on the license that you purchased. Verify that your name, address and email address are correct, click Next. In the P.O. field, retype the Promo Code. Click Next. Verify all entered information is correct, then click Place Order. 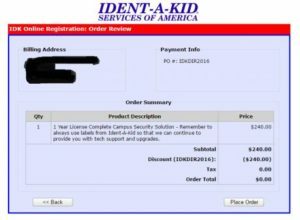 You should receive an email with your license code and school/account number. As a new customer using version 3, you will create your registration account when the Client and Manager on your PCs are registered. After the Client and Manager have been registered, when opening the Manager, it will give you an option to Activate License. This will load up your default web browser and take you through the steps to create your account. Give us a call! 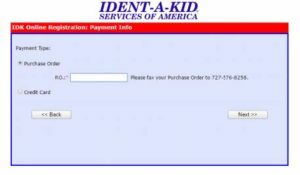 We can look up your account information. Your main check in screen can be thoroughly customized. The badge names can be changed along with descriptions for each badge. Your school name can be centered on the page along with a school logo at the bottom if you wish. There are many more options for customization, just check out the user guide on our support page. Yes! This is an advanced option so please give us a call so we can assist you. It should give you two options when running on trial, Continue Trial or Activate License. If you have paid for a license then go ahead and click on Activate License. It will open your default web browser and take you to the registration account creation page similar to the image below.